Of course, as an Uglies fan, I was in fits of joy (quiet, pew-located, sitting-still fits of joy). It also struck me how the most everyday things can inspire such incredible stories. No one reading Uglies would ever imagine its roots were in an LA doctor’s office and a reference to Tom Cruise’s teeth, but they were! That dentist has NO idea what she’s done. Probably a good thing, as she’d want royalties. 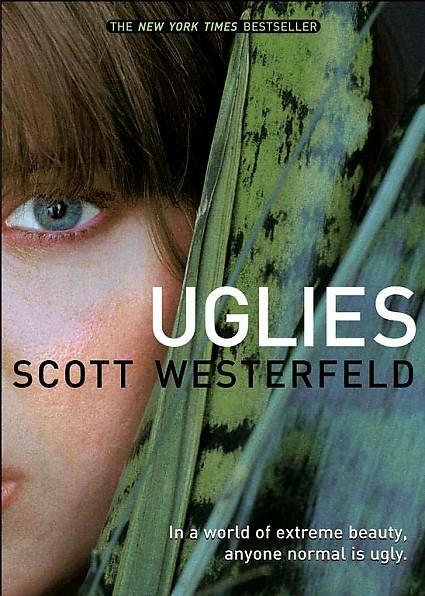 The success of Uglies basically gave Westerfeld license to do anything he wanted with his next creation. The result of this creative freedom was Leviathan, a steampunk (the wiki on steampunk is great; read it) novel set during World War I — an alternate World War I. Not just historical events are alternate. Technology is alternate — Charles Darwin discovered DNA and The Origin of Species is a how-to manual of genetic manipulation. The result is that in 1914 engineers have created these huge beasts-machines as war weapons. One is “the Leviathan, a massive and famous air-beast, which is mainly modelled after a whale, but is actually a massive ecosystem” (from the wiki). The main characters in Leviathan are Prince Aleksander of Hohenburg, who is the fictional son of Archduke Ferdinand (Ferdinand didn’t have a son named Aleksander), and Deryn Sharp, a girl who dresses as a boy so she can enlist in the British Army. 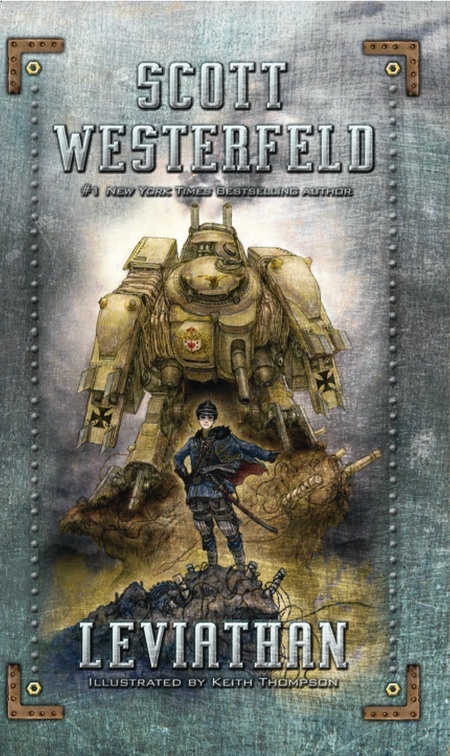 Westerfeld was fascinated with the fact that the deaths of only two people, the Archduke and his wife, snowballed into a worldwide conflict that killed millions of people. “When a parent dies,” he said, “it’s like the world is broken. Can you imagine what is must be like for Ferdinand and Sophie’s children, to have their personal family tragedy actually break the world?” And that’s how he decided Aleksander would tell the story. Similarly, in his studies of previous wars (can you tell this guy is a history and technology geek? I love it! ), he kept encountering stories of women who wanted to enlist in the armed forces, so they disguised themselves as men. One woman in the Civil War kept up the guise so well that years in, she went to her fellow soldiers and said, “You have known me as a brave, honorable soldier, have you not? Well guess what. I’m a woman! We’re just as good as you; you should let us vote!” And they sent her to the mental hospital. Le sigh. So he decided that would make a great character — a girl who has to keep the secret of her gender at peril to her life. The other aspect of Leviathan that makes it unique is that it is illustrated. Nowadays, as children get older and graduate to more mature books, they say, “This looks boring. There are no pictures!” And the well-meaning adults say, “That’s because you use your imagination!” (Like Belle tells Gaston in Beauty and the Beast!) But that hasn’t always been true. It used to be normal for adult books to have illustrations. 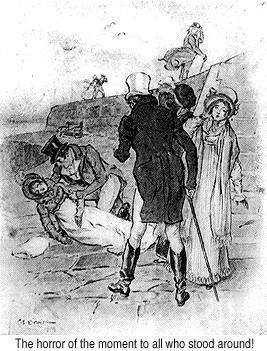 To make his point, he put up an illustration of Louisa Musgrove falling off the rock in Persuasion by Jane Austen. I DIED — did he really use Jane Austen? He has no idea how happy that made me. I think this is the exact image he used. I’ve seen this image before; I think it’s fairly famous in the world of Austen illustrations. Why did illustrating novels fall out of fashion? Why, the advent of the camera. There used to be illustrators running around who would draw everything we nowadays take pictures of — trials, birthday parties, etc. The camera basically rendered the illustrating profession useless, so there were no illustrators to illustrate novels. This meant that novels became text-only. To make Leviathan look like it could have been published in this alternate 1914, complete with 1914ish illustrations, Westerfeld worked with a Canadian illustrator named Keith Thompson. His work is incredibly detailed and vibrant. I am not finding any examples of his work from Leviathan (go figure, copyright much? 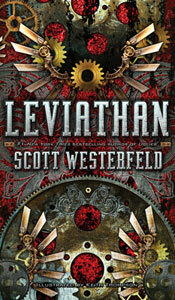 ), but here is a cover for Leviathan he drew that they almost used. This much better represents his drawing style than the cover they ended up using. I was in nerd heaven listening to Westerfeld explain how he came up with the ideas for these books and how they were shaped by his different interests in history and war and technology. Now I need to actually go read Leviathan and Behemoth! Reading them after hearing from the author how the books came about will be fascinating — it’s not often one gets to read a book with that approach. This entry was posted on October 21, 2010 at 1:12 pm and is filed under Books and reading. You can follow any responses to this entry through the RSS 2.0 feed. You can leave a response, or trackback from your own site.